Husband and wife Ryan Sherlock and Melanie Spath have taken the two main member-voted awards at Cycling Ireland’s annual awards dinner. The Cycleways CC duo were voted best male and female domestic-based riders of the year. Sherlock had a fantastic year on home roads, winning a whole host of races and riding very competitively in the An Post Rás against professional opposition. He finished the year atop the Irish rider rankings and was competitive from the very early weeks of the year right to the last days of the season, taking his most recent victory in October in the National Hill Climb Championships. While Spath has been one of the very best female riders in Ireland for a number of years, she had something of a breakthrough year in 2012 despite studying for the final stages of her PhD during the season. She lifted the National Road Race Championship, was second in the time trial title race and also won the MTB title. Her road race crown was a massive achievement and having declared for Ireland this year, the German-born rider will be one to watch riding on the road for Ireland in 2013. Martin Grimley of Dromara CC took best volunteer of the year. He has been instrumental in growing the popularity of the off road scene in Ulster but has also done a huge amount of work to bring youth riders into the sport. A mark of his commitment was that he travelled to Dublin for the Cycling Ireland Pedal Fever conference on Saturday afternoon but after it left for home to prepare for the Ulster Cyclocross Series latest round in Belfast on Sunday morning rather than attending Saturday night’s awards event in Dublin. He was presented with his award at the race on Sunday in Ormeau Park. He adds his Cycling Ireland award to the Cycling Ulster volunteer of the year award he took last year. The club of the year went to Cuchulainn CC in Co Louth, with the voting separating the top three by just a couple dozen of votes. Cuchulainn CC have developed cycling in Dundalk and the surrounding area for many years and in 2012 put on the junior and vets National TT Championships and the juniors and A3/A4 road title races, to mention but a few races. The most popular sportive this year, the An Post Sean Kelly Tour of Waterford won the best leisure event, while the An Post Rás won the domestic race of the year. 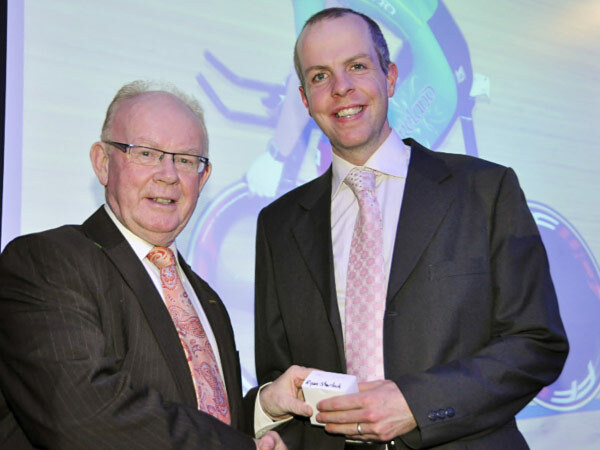 The prizes were awarded at Cycling Ireland’s annual dinner in Dublin on Saturday night.